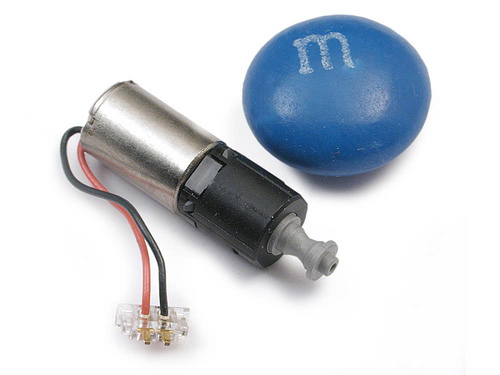 For smaller applications where precise and small motors are necessary you can use micro motors. Some of these can be controlled with voltages as low as 1.5 volts DC. DC Gear head motor. Image compliments of Solarbotics Ltd.
GM Gearbox with auto-center spring. Image Compliments of Solarbotics Ltd.
GM Geared Pager motor. Image Compliments of Solarbotics Ltd.
Solenoids are linear motors activated in the same way you would activate a regular motor. They consist of coils of wire in which you insert a metal pin. When the power is activated, the coils create a magnetic field and this pulls the pin down. The closer the pin is to the magnetic field the more pull strength you will get. 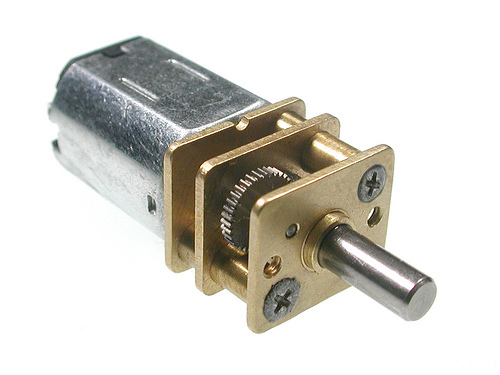 Common Solenoid in a square package. Notice the holes and slot on the silver plunger, which attaches to the device or lever. You can use a power driving Darlington transistor such as the TIP 122, discussed in Chapter 9, or you can drive many of these devices using a ULN2803A Darlington Transistor Array. 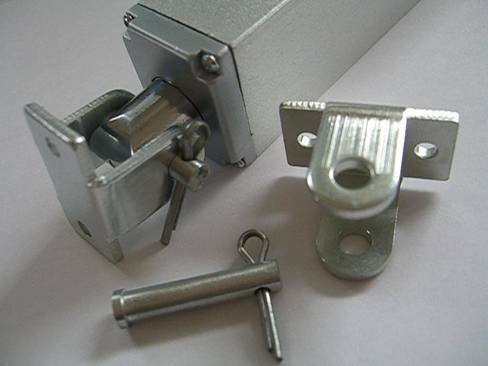 Some solenoids come with springs, which hold the metal pin above the magnetic coils, and other solenoids come without springs, which you must supply in order to pull the coil up with a spring. There are push/pull solenoids that go in one direction and then the other. 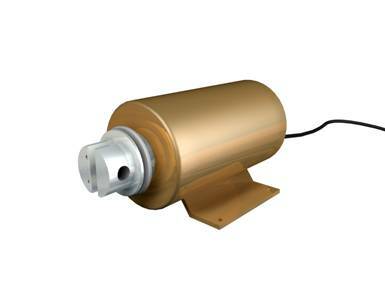 Continuous tubular push/pull solenoids at 12VDC are common and can be found at Jameco.com. Their life expectancy varies, so always check the data sheets. Jesse Hemminger created a sound sculpture concerned with the continuity of family. He created molds of each family member, casting their fingers in plaster and inserting aluminum inside each cast plaster finger. 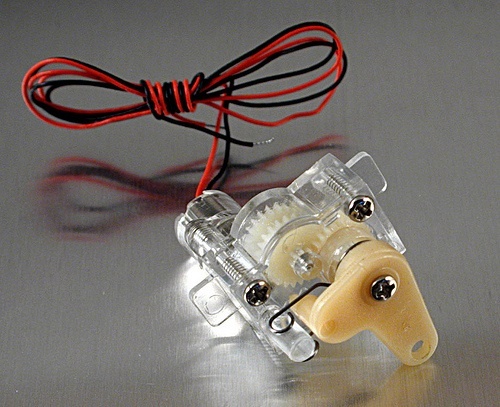 Proximal Actuator by Jesse Hemminger. 2001. Photo Amy Youngs. 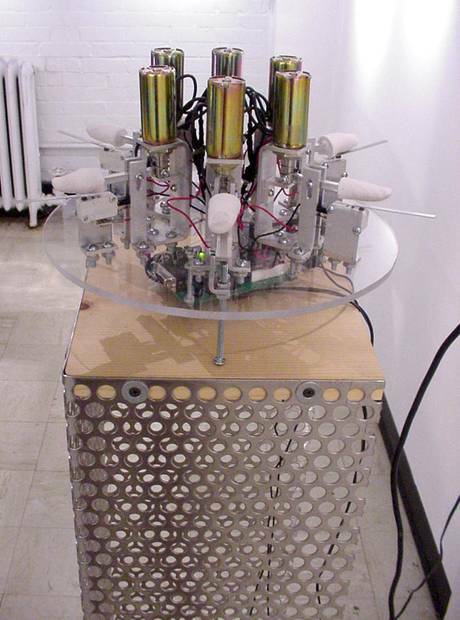 The fingers and aluminum levers were attached to solenoids, and as you pressed a limit switch near the fingers, they would click down in complex and evolving rhythmic patterns. There are also "rotary" solenoids, which rotate roughly 45 degrees when the electromagnetic coils are activated. 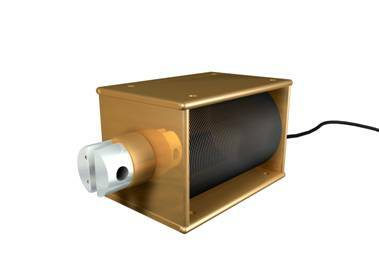 You can also activate air-powered muscles with solenoids if you use pneumatic solenoids. A good source of used solenoids is C & H surplus, though suppliers like http://llelectronics.com and http://jameco.com carry a selection of standard solenoids. 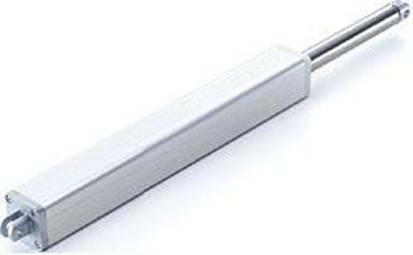 If you want more activation with longer reach you can use a linear actuator. 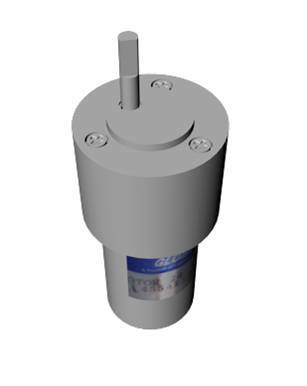 The actuators can have quite a bit of force with some as powerful enough to lift 400 pounds. The one below can actuate out to 30 inches with a force of 40 pounds. Tubular actuators are nice looking and clean and well suited for art and design applications where the actuator is going to be seen. They can run on 12 volt DC current and work great with the H-Bridges discussed in chapter 13. Pay attention to the amperage used as they come under load. The one above can extend out to 30 inches.